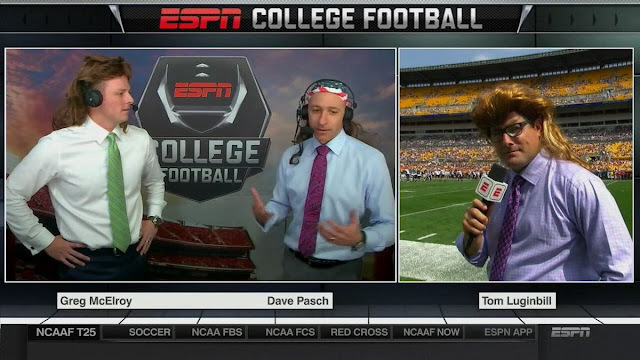 Shirts With Random Triangles: Dave Pasch in a mullet wig? Why yes, please. Pitt went on to scoring it's first touchdown of the game following the mullet incident, which may of may not have unleashed some kind of bad karma into the proceedings. One does hope that Pasch keeps the mullet to wear this winter when he is once again teamed with NBA Hall of Famer Bill Walton, especially considering the possibility that wig was made from Walton's actual hair from days gone by.